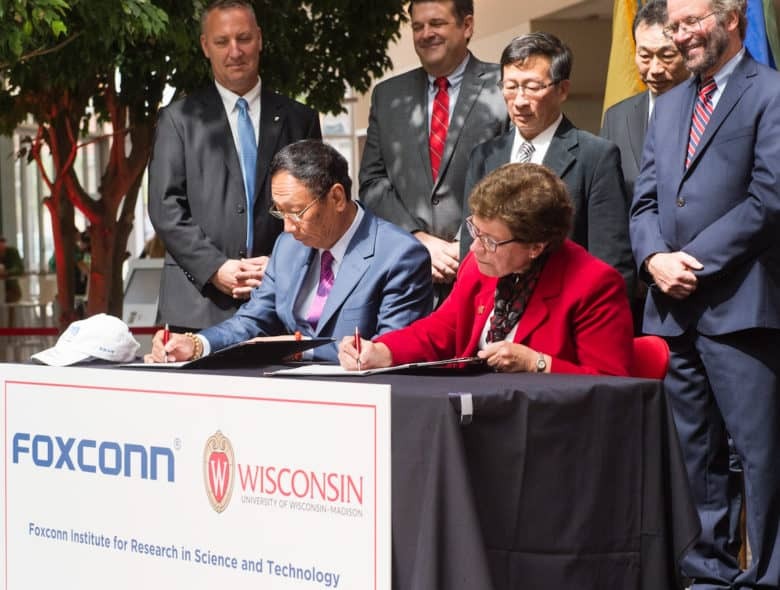 Foxconn and University Wisconsin officials signing a deal for a research center. Apple supplier Foxconn may be rethinking its U.S. manufacturing plans in Wisconsin, but the Taiwan-based company wants people to know it’s serious about delivering the jobs it promised. Responding to a recent report, Foxconn says it will keep its promise to create 13,000 jobs in Wisconsin. There’s no doubt that the political system has changed considerably since 2017, when Foxconn made its deal to open a U.S. factory. The company’s recent earnings have been disappointing, and a burgeoning U.S.-China trade war has taken its toll on the Chinese economy. Nonetheless, many people are rightly upset at reports that Foxconn is scaling back plans — after receiving what is reportedly the best subsidy package in Wisconsin’s history. Foxconn has already lost out on some of those tax credits after missing hiring goals for 2018.